Runde's Room: Question Fans - Updated! Just a quick post tonight to let you know I've updated my first four question fan sets (I'll post the links below). For each set, I've now included a checklist page for each strategy or element that contains all the questions. I also added a blank page of question strips for each strategy in the Comprehension Fans (the other sets already had these included). For all of you who have purchased these sets, you can download the revised version under your "my purchases" link at TPT. Look for the flashing link that says "Newly Revised Re-Download" and click on that. If you are only looking to print out the new checklist pages, they are at the end of each resource. I also wanted to share a fabulous idea I had from one of my followers who wrote me to tell me how she was using them in the classroom. She was using the Reading Reflection Fans. She printed out the checklist sheets to give to the students. She then had students choose one question from each level of question sets to make their own summative assessment for their reading test. Talk about differentiation!!! 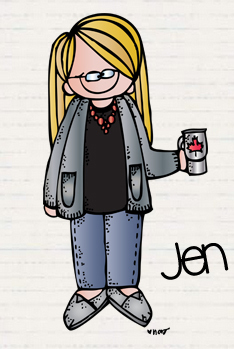 I thought this was such a spectacular idea, I did it for my students' summative test for our novel study. To save on paper, I put each checklist sheet under the ELMO, and had students write down one question from each level. When they were finished, they had 6 different questions (that they chose), focusing on each level from Bloom's Taxonomy. The level of engagement and success on this test was so much higher than other summative assessments, because the students were so invested in it. I really want to try this with my Math Reflection Fans when we get to the end of our current unit. 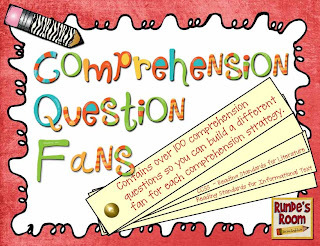 Comprehension Question Fans - Strategies include: asking questions, determining importance (main idea), inferring, making connections, summarizing, synthesizing, and visualizing. I use these for guided reading groups - students use them to start conversations with each other after reading, for pair-share activities after independent reading, as questions in our reader response journals, and after read-alouds. I use them in combination with my other sets of question fans, depending on the book or text read, or our current focus for reading. 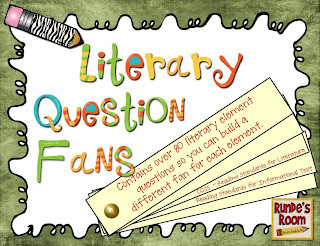 Literary Question Fans - Literary elements include: author's purpose, characterization, figurative language, point of view, and tone and mood. 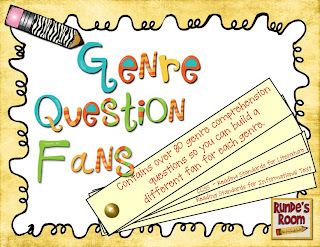 Genre Question Fans - Questions for specific genres: fictional narrative, personal narrative, persuasive writing, informational writing, and poetry. In addition to using these for books we read in class, I also have students answer questions about their own writing with these fans. 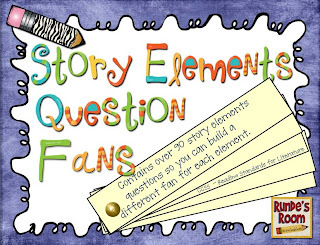 Story Elements Question Fans - Story elements include: plot, setting, character, theme, and conflict. 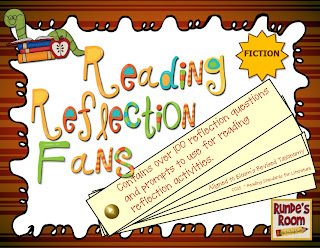 Reading Reflection Fans - Based on the 6 levels of Bloom's Revised Taxonomy. I use these more as summative questions after we have finished a novel or book study. Math Reflection Fans - Based on Bloom's Revised Taxonomy. I use these as exit slips after math lessons, as questions after problem-solving activities, at the end of the unit as review, and as reflection questions in our math journals. These are awesome!!!!! I am heading over to TPT to add them to my cart right now. Thanks so much for making these! These look great. I LOVE your math journals and am very interested to see more about your math reflection fans. Thanks! 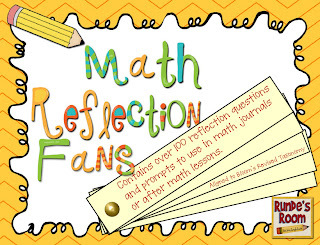 I've got your math reflection fans AND your math journal. I LOVE the idea of writing their own assessment! I just might try that this week!